‘Vrat ka Khaana’, Published by Bookwise (India) Pvt. Ltd., reprinted in March 2007. A book with recipes that can be made during ‘vrats’ (fasts)—Phalahaar. Keeping in mind controversies of what is allowed and not allowed, the author has made fasting food interesting. Especially good for the young daughter-in-law who wants to impress her fasting Mother-in-law! Most fattening, but delicious ! Wash saboodana till water clears. Soak in water, with level coming upto 3 cms / 1½" above the sanoodana, for about 1½ hours. Drain in a colander and mix in potatoes, salt, chilli powder, hara dhania, green chillies and lemon juice. 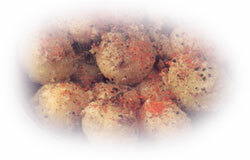 Shape potato mixture into flat, round vadas 5 cms / 2" in diameter (grease hands if it sticks). Heat ghee/oil for frying. Fry vadas golden and crisp on both sides and serve hot, with a chutney. Long list of ingredients, but simple to make ! Grind together green chillies and ginger. Powder together sugar, laung, daalchini, choti elaichi. Mix together, potatoes, dahi, dhania, kali mirch, green chilli and ginger paste, and the salt. Heat ghee in a pan, and add kadhi patta and zeera. When zeera splutters, add potato mixture, and sauté till oil separates. Remove from flame, mix in the powdered ingredients and serve immediately. Rich and creamy -- a reward for fasting ! Mix together paneer, atta, magaz, namak, chilli powder, dhnia powder, well enough to coat the paneer. Heat the ghee, add green chillies and ginger to it. Sauté till slightly coloured, then add paneer mix. When the paneer is light brown, add enough water to cover the paneer and bring to a boil. Leave to simmer for 3-4 minutes, until well blended. Add malai and half of the hara dhania and heat through. Serve hot, garnished with the remaining dhania. Really adds zest to your fast ! Grind al the ingredients together, to a fine paste. Can be stored in a dry jar and refrigerated for a few days.